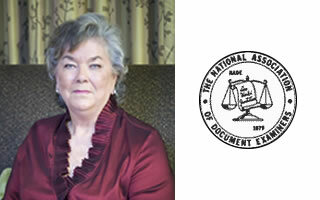 National Association of Document Examiners Seminars (24) 1994, 1995, 1996, 1997, 1998, 1999, 2000, 2001, 2002, 2003, 2004, 2005, 2006, 2007, 2008, 2009, 2010, 2011, 2012, 2013, 2015, 2016, 2017, 2018. "I would certainly recommend Ms. Hunt to anyone looking for a document examiner. She is thorough and persuasive."